����An accident at an experimental nuclear waste storage facility, the Western Atomic Longterm Dumping Organisation (WALDO for short), has leaked toxins into the local water table. Senior engineer Heinrich Schmidt (Ross Thompson) is badly contaminated in the accident and flees from medical treatment when he suspects that the crooked managers of the plant are planning to "keep him quiet". ����Heading through nearby bush, Heinrich comes across Sydney mechanic Larry Stilson (Steve Bisley) and his wife Carmel (Arna-Maria Winchester) who are out bush for a dirty weekend. The pair take in Heinrich, but the WALDO heavies are desperate and the pair of good samaritans soon find themselves a target. Copious amounts of car stunts, and other assorted action (much of it to the spectacular backdrop of an abandoned shale mine), ensue as the trio attempt to get out word of the mishap and save their own skins. 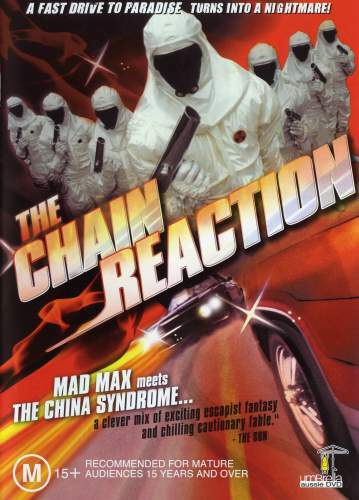 ����The Chain Reaction is a pretty decent attempt at recapturing the magic of Mad Max a year after it exploded onto screens and into the bank accounts of Aussie producers. Steve Bisley stars in a very similar role to his Goose character from Mad Max. "Associate producer" George Miller, as well as many of the other Mad Max crew, were responsible for many of the stunts and action cinematography. There's even a blink-and-you'll-miss-it cameo from Mel Gibson, as a workmate of Larry's. ����Like Mad Max, the stunts and action are great. The raw, pre-CGI, car chases and high speed crashes are well and truly the highlight of the film. The story is solid, if a little routine, and supports the fast paced action well. There is little question as to whether the emphasis is towards the story or the stunts though - it is very much the latter. ����The film is presented in a 1.70:1 aspect ratio (from an original 1.66:1 aspect ratio) and is 16x9 enhanced. ����The video looks very good. The image is sharp and features only mild film grain. There is a good level of shadow detail, although some of the blacks lock a little more live very dark grey than true black. The colour in the film is a little murky, but generally quite natural. ����The video is free from compression related artefacts. A reasonably number of small film artefacts and a few reel change markings are noticeable, however, with noticeably more noise near reel change points. ����No subtitles are present for the feature. ����This is a RSDL disc. The layer break occurs at 51:48 but was not noticeable on my equipment. ����A single English Dolby Digital 2.0 (224 Kbps) audio track is present for the film. ����The audio is limited by the basic nature of the original mix, but generally sounds quite good. Dialogue is clear and generally in good sync. ����The movie features a hokey electronic score from Andrew Thomas Wilson, which is as much a testament to the era the film hails from as the helmet haircuts and flares on most of the characters. ����There is no surround or subwoofer usage. ����A very good making-of featurette that covers the production process, the reception of the film and its place in the annals of Australian film history. The story is told from a series of recent interviews from with director Ian Barry, producer David Elfick and star Steve Bisley. A little too much time is spent discussing the story concept, but that makes for a small gripe and one that is quickly made up for by the rest of the featurette. ����The Chain Reaction director Ian Barry's earlier short film. The Sparks Obituary was intended to be made into a feature, but the producers could only raise the capital for a short (albeit one that managed to attract the likes of plenty of notable Aussie actors, including Hugh Keays-Byrne) as they had trouble selling such a far out sci-fi concept to financiers. ����This is the story of Harry Sparks, an acclaimed film director who went blind making what he would claim was to be his opus. A notoriously shifty millionaire, come movie producer, has enlisted Sparks to complete his film using an experimental machine that will translate his thoughts into moving pictures. The machine puts a tremendous strain on his state of mind and both his physical and mental health, but the results are astounding. So astounding that the producer is reluctant to turn the machine off even when it pushes Sparks to the brink of death. Never fear, feeble Sparks will find his revenge through the machine. ����This is a dark and engaging work of science fiction that is easily as worthwhile as the main feature on the disc. Though it came much earlier and the two are in no way related, The Sparks Obituary treads similar ground to Dennis Potter's acclaimed Cold Lazarus. Surprisingly decent low budget effects, great acting, great story. ����A handful of deleted and (mostly) extended scenes. Nothing that really adds anything to the film. ����A fairly effective 30 second trailer for the film. ����A clumsy, overlong trailer for the film that gives away too much and tells too little about the film. ����A short slideshow of production stills and international posters for the film. Some of the European posters are worth a look, but the presentation style (a silent three minute video) is far from the best way to present the material. ��������Trailers for other Aussie classics from the era, Road Games, Survivor, The Time Guardian and The Cars That Ate Paris. ����A bare-bones, budget edition of The Chain Reaction was released in Region 1 some years back (billing it as a Mel Gibson movie, no less), but the Region 4 outclasses it in every way. ����Steve Bisley, fast cars and a sinister conspiracy. An entertaining action/thriller from the height of the Ozploitation era. ����The video and audio are decent. The extras are excellent, particularly the short film The Sparks Obituary.